The length of the races and preparation that goes into them makes it feel like it means more. When you've gone through three practise sessions (reaching target times for team testing), then competed in three qualifying sessions, the race itself feels like a big event. So in the situation above, you don't feel the desire to make a rash, videogamey decision. 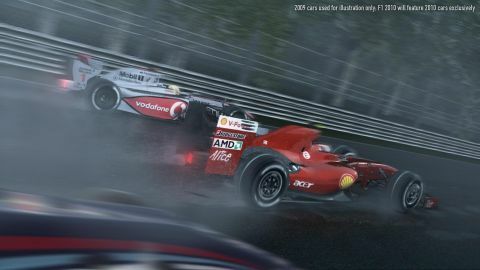 You want to do it properly – and that's something that F1 2010 gives you better than any other current-gen racer. There are a few missed opportunities. The lack of a champagne-spraying sequence when you win is a surprising omission, especially as I expected it not only to be there, butto be interactive, given the rest of the immersive features the game has. Maybe the reason for this is that you never see any of the other drivers in the paddock. Despite the full license for driver names, you only ever see photos of them, which makes this quite a one-man show.